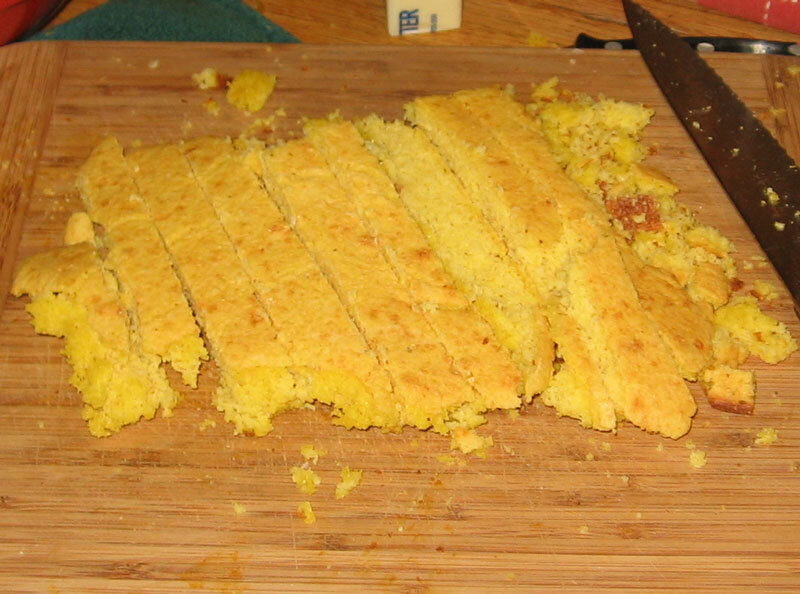 I made it home Wednesday night with a package of cornbread stuffing and a bag of cornmeal. 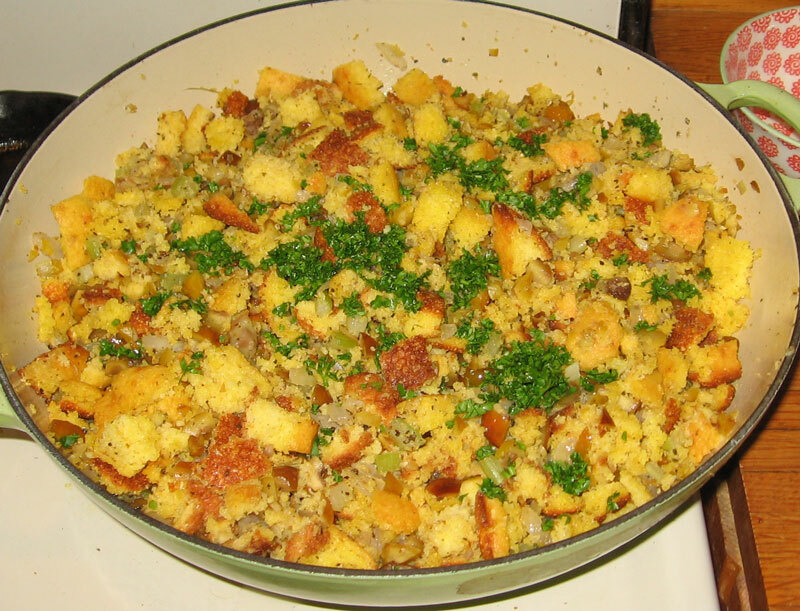 (I wasn’t sure if I would be up to baking the cornbread and all…) But when I woke up Thursday morning, I was kind of excited about making stuffing from scratch. The recipe for stuffing that I came up with was inspired by a recipe from Chestnut Cookbook, the package of stuffing that I brought home, and my sister’s comments while I was cooking. 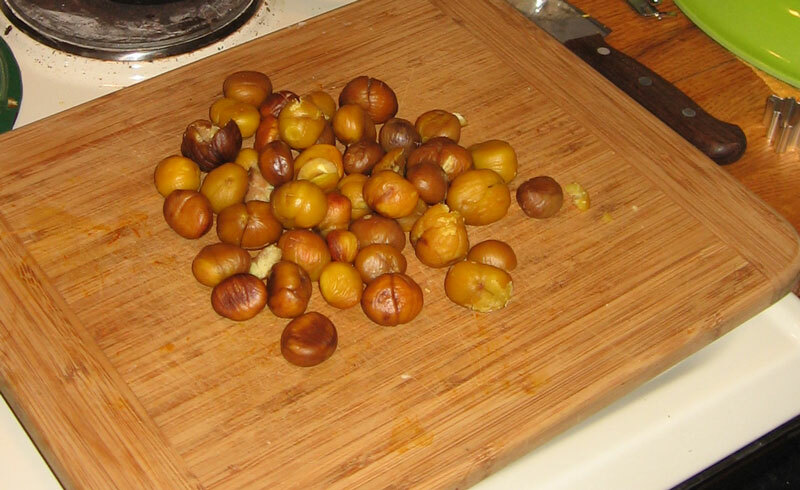 Cut an X into the top of each chestnut and then bake them in a 350 degree oven for about 30 minutes (or until tender). I bake them in a covered dish, and when I remove the dish from the oven I take a few nuts out at a time, leaving the rest warm for easier shell removal. Remove shells and chop finely. Set aside. Meanwhile, melt butter in large pan over medium heat. 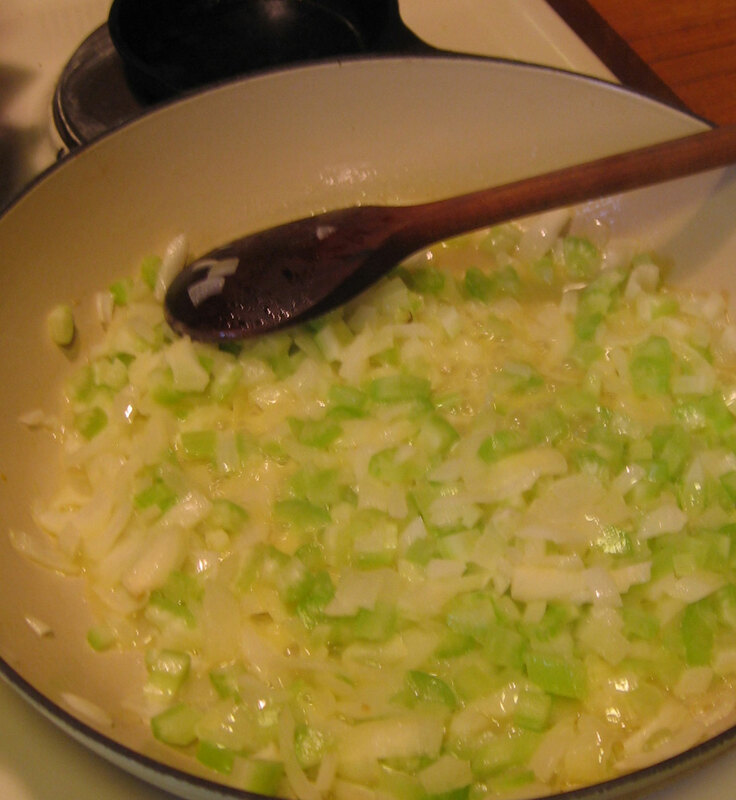 Add onions and then a minute or two later the celery. Cook until translucent, taking care not to burn. Add sage, salt and pepper to taste, and chestnuts. Stir for a few minutes, and then add breadcrumbs. Pour in a little boiling water (I am sorry to say, I have no idea how much I used here..maybe about a cup). It should be enough to moisten the breadcrumbs, but not make them soggy. Cover and place in a 350 degree oven for a few minutes to warm before serving. I guess that you could stuff it inside a bird too, but I really don’t have any idea how! Much better. I am definitely switching from the packaged stuff!